Creating a resume and cover letter can be tricky, even if you work for an employer and your career is pretty straightforward. For freelancers, it's even more complicated. Not only do you have to grab the client's attention, pitch your skills, and prove that you're the best person for the job, you also have to make sure that the breadth of your experience makes you look accomplished, not scattershot. Remember, even if you never have an employee or choose to incorporate, you are a small business owner, not someone who's doing odd jobs. Review these tips for writing resumes and cover letters that will help you get the gig, examples of both, and templates you can download to get your own letter and resume started. 1. Make a list of everything you're good at. Before you even start looking at resume templates or thinking about what you want your resume to look like, you need to remind yourself of why you're such an amazing catch for a prospective client. The best way to do that is to start with a simple list. Skills. This includes both hard skills, like software packages and computer systems, and soft skills, like teamwork and management experience. Education and training. Go beyond your degrees and formal certificates. Professional training and classes that are relevant to your work count, too. Achievements. Win an award? Graduate with honors? Publish a paper or acquire a patent or trademark? Write it down. Accomplishments. Include projects you've managed or participated in, from website redesigns to business acquisitions to department restructuring. Don't exaggerate -- and certainly don't lie -- but if you contributed to the success of a discrete, tangible improvement at a company or as a freelancer, put it on your list. 2. Decide which types of jobs you're going after. And now here's some bad news: you're probably going to have to make more than one resume, especially as a freelancer. Unless you're only going after one very specific niche job in an industry, you'll need to create targeted resumes to apply to each type of gig. To make this as easy as possible, think about what types of jobs and clients you plan to focus on, and then match those with your skills list. Pretty quickly, you'll start to see how many and what kind of resumes you'll need to develop. You can probably get by with no more than two or three basic resumes, which you'll then adapt further for specific clients. Note: if you opt to create personal templates like these, it's a good idea to enlist an eagle-eyed friend to proofread each resume and cover letter before you send them out to prospective clients. Nothing terminates a nascent client-freelancer relationship faster than a cover letter with the wrong company name on it or a resume with totally off-base skills and focus. 3. Develop your elevator speech. Now you know what you're good at, and what you want to do. Distill that into a description that takes a minute or less to deliver -- in other words, about the length of time it would take to explain your goals to a stranger in an elevator. Another way to think about this is as your LinkedIn-headline speech or your Twitter-bio speech -- in short, it's the essence of who you are and what you want in a freelance career. Whatever you want to call it, this will be the organizing idea behind your resume. Depending on the format you choose, it might even go at the top of your resume or CV. Chronological, by gig or project. 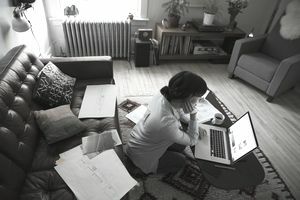 Full-time freelancers who've been working for themselves for a while will want to dispense with the life-story format used by many job seekers who solely work for one employer. The organizing principle here is the order in which you worked on projects. Combination, including your full-time employment. Newer freelancers might wish to do a combination resume, which includes both work history and skills. By skillset. Also called a functional resume, this style highlights what you can do, not the order in which you acquired your skills or demonstrated them. Your resume is not an autobiography; at most, it's a profile piece in a glossy magazine. Better yet, it's your most targeted social media profile -- organized, precise, and directed unwaveringly at getting you the opportunities you want the most. This means you need to cut out anything that isn't totally necessary, including unrelated job skills and accomplishments, no matter how impressive, and any projects that don't demonstrate your aptitude for the gig you're after. 6. Skip these unnecessary space wasters. Objective. Usually taking up a line or two of space at the top of your resume or CV, this is redundant after your targeted cover letter and costs precious seconds that potential clients could be using to take in your skills and experience. References available upon request. You should definitely have professional references, ready to go -- but you don't need to tell people that. They'll assume that you'll be willing to furnish them with contact information for happy clients and previous employers. In the olden days, graphic artists carried heavy portfolios and journalists toted binders full of yellowing clips, but now you can store your work samples online, via any number of free or paid services, and add your URL directly to your resume, cover letter, or application materials. This is an example of a resume for a freelance position. Download the freelance resume template (compatible with Google Docs and Word Online) or see below for more examples. Award-winning Freelance Writer, Editor, and Social Media Manager with 10+ years’ experience creating online content that draws plenty of clicks, as well as elegant documents and articles for various clients. Have Written About and Edited Content on Men’s Health, Sports, and Parenting. Founding editor of this Bloggie-winning, highly trafficked website that has been cited in Yahoo! Sports, Deadspin, Sports Illustrated, and even The New York Times. Interview major sports figures in the NFL, NBA, and MLB for regular posts and articles. Oversee a staff of 10 freelance writers and editors who contribute weekly content. Contributed to sports, health, and parenting sections as a freelance writer and editor. ﻿Created targeted content based on traffic analysis, often producing most-read pieces on the site. Edited copy produced by nearly 100 freelance writers through the U.S.
1. Focus on being the solution to the problem. Why do they need you? Because they have a problem they need to solve. Your goal is to show why you're the best person to provide that solution. This focuses your cover letter right off the bat. No longer are you thinking of your entire work history or even the skills of which you're most proud. You now have a laser focus on the thing that really matters: fixing what's broken, turning the merely good into the truly excellent, and saving the company time and money as you do so. 2. Format for the bored and busy. At its most basic, the freelancer's cover letter looks a lot like everyone else's. You need at least three paragraphs in your letter: an introduction explaining how you found the job or lead, a middle paragraph outlining your skills and abilities, and a closing paragraph indicating how you'll be following up. Beyond that, focus on making your letter easy to scan. Bullets are your friend, especially when you're listing your relevant skills or projects that demonstrate your talents. Assume that the person reading your cover letter will spend only a few seconds on it, and make sure that he or she can see the highlights in just a quick glance. Don't forget to include keywords, especially if your materials will have to go through some sort of screening software in order to make it to a real, live person. 3. Give it a personal touch. At least 60 percent of all jobs are acquired through networking, and freelancing is no exception. It's always better if you can have a mutual acquaintance pass along your materials, including your cover letter. 4. Let your work speak for yourself. Don't forget to include URLs to online clips, sites, or projects, or references to an attached portfolio of your work, along with an explanation for why these particular work samples are relevant to the company's needs. Don't include everything you've ever done, or anything unrelated to the industry or the company. 5. Follow up, but don't stalk. Close your cover letter by letting the hiring manager know when you're going to follow up, and then keep your commitment -- but don't continue to pursue the contact if things don't pan out. If you don't hear back after your initial communication, or at the designated time of follow up, it might be appropriate to try one more time, after two weeks or so, to make sure that you haven't slipped the manager's mind. After that, though, you have to assume that it's not going to happen with this particular potential client, at least at this time, and move on. If you exercise restraint, you won't close yourself off to future opportunities to work with the company. This is a sample cover letter example for a freelancer. Download the cover letter template (compatible with Google Docs and Word Online) or see below for more examples. My former editor [contact name] recently told me about the senior writer position at XYZ Website, and I was excited to hear about the opportunity. I've spent the past 10 years developing award-winning, high-traffic content for sites like Mensmag.com and The Monday Morning Quarterback, which I founded and built to a top 10 sports site. Analyze traffic and target content creation to build page views. My content on Mensmag.com is consistently among the top 10 most-read pieces on the site, and creating and building The Monday Morning Quarterback has taught me how use analytics tools to chase down trends worth pursuing and build an audience. Help you get that blue verified checkmark. I expanded the Mensmag Sports Twitter feed from 500 to 50,000 followers, including big names in the industry like Joe Sportsguy and ESPN Commentator. In July of last year, I helped earn the feed verified status. Get attention from the people who matter. Whether it's getting retweets from names in the industry, boosting market share among the 18-34 demographic, or earning Bloggie awards, I have experience making great websites into excellent ones and getting them the attention they deserve. I would love the opportunity to talk with you about the position and what I might bring to it. I've attached my resume and clips, and will email later this week to see if we can arrange a time to talk. Thank you for your time and consideration.